This inquiry project was part of a unit of study that spanned the entire spring term at Westwind. The teachers provided guided questions to facilitate the idea that there are multiple identities that one person can have (such as school and personal identities). The students investigated the concept that the school is a construct of multiple individual identities. 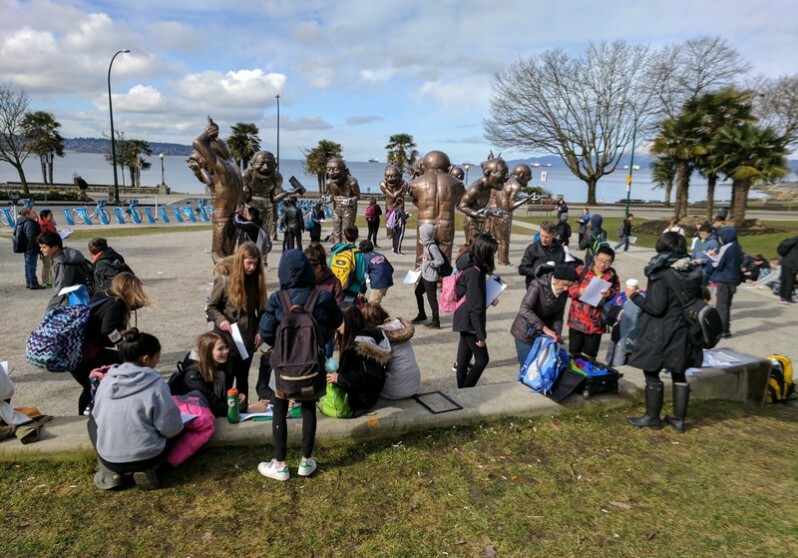 The Vancouver Biennale public artworks reinforced and inspired students to re-examine their initial thoughts about what identity and art can be. In their unit plan on identity, students also examined specific styles of art and media (music, art, movies, television, and the Internet) to analyse the affects and influences of media in forming their sense of identity. They also examined their identity as it related to their habits as shoppers and consumers. 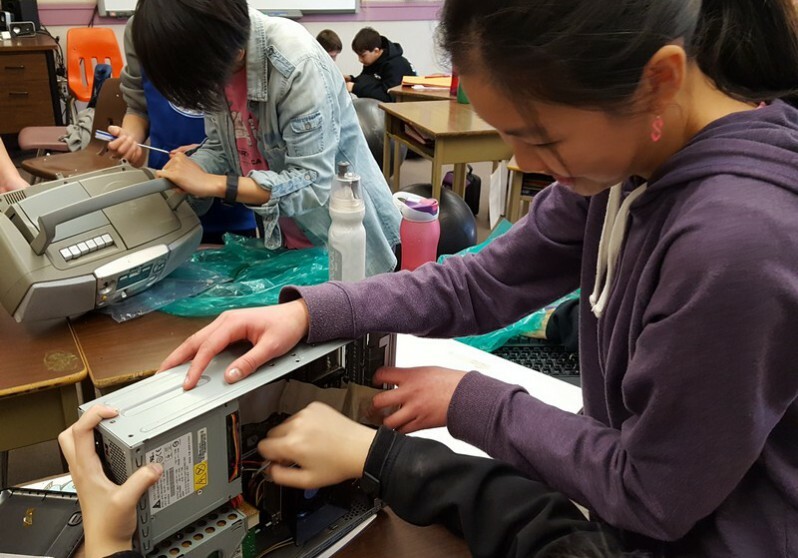 Three classes of grades 6/7 worked collaboratively to fully engage in disassembling obsolete and broken manufactured items that would have been, hopefully, destined for the recycling depot. 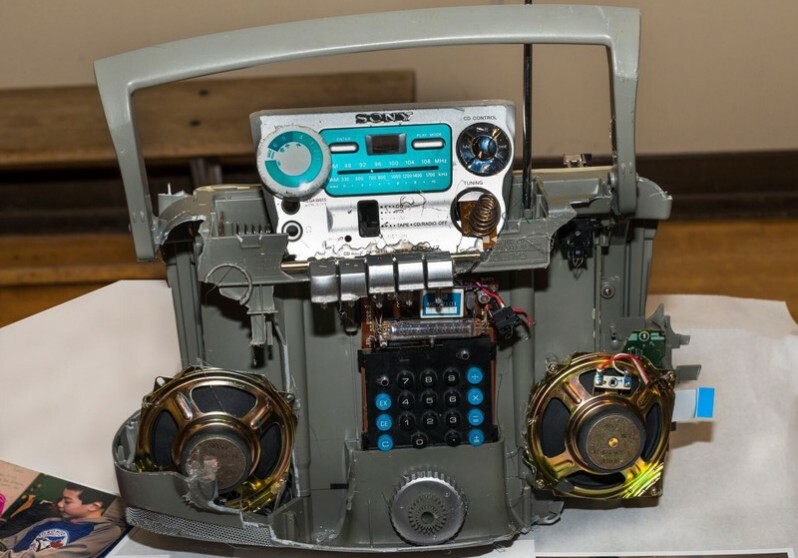 The components of the appliances were repurposed as art supplies for building unique sculptural works, comprised of a stunning array of forms, textures, colours, and parts such knobs, dials, handles, frames, and speakers. Hidden behind slickly designed and familiar commercial products were surprising pieces for use not only in building a large basic structure but also in embellished and adding details to their concepts. 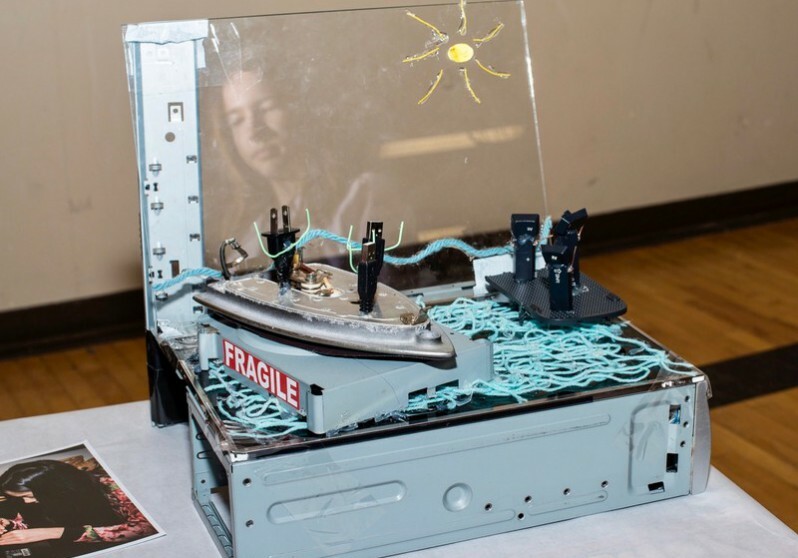 “MAKING GLOBAL CONNECTIONS IN OUR CREATIVSERSE,” the title for their well-attended exhibit was the result of brainstorming by the three classes. 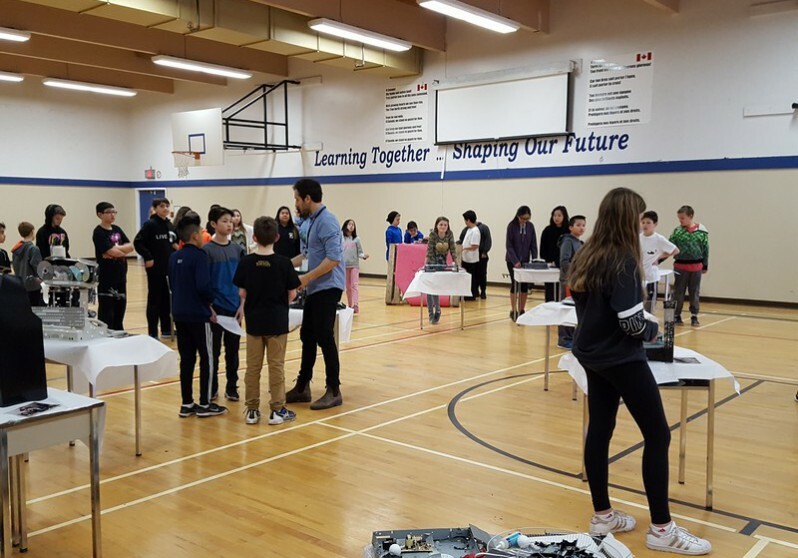 As a further reference to the theme of global connections, students exhibited heaps of the unused parts and pieces on shipping crates in reference to the global shipping that connects the raw materials to the factories and then delivers the products to global shopping centres. Through art making and creative endeavors, one’s sense of identity and community continually evolves. Media sources can affect our understanding of important events and issues. How can art be used to explore and express our sense of identity? How can a better understanding of identity contribute to positive social change? How do media impact our understanding and contribute to the formation of our own identities? Visual Arts: Learning about the artists informs us about their work and ideas. Art works evoke discussions and prompt further understanding of universal themes in their body of work. 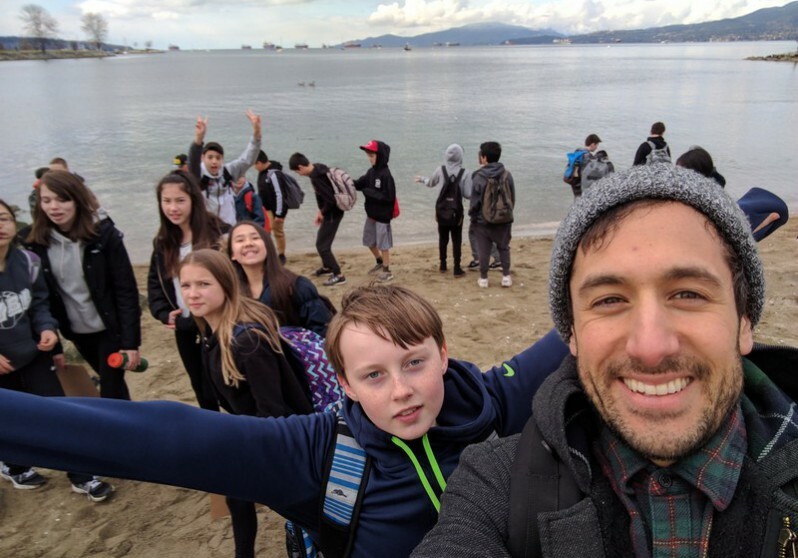 English Language Arts: Exploring stories and other texts is a way of understanding ourselves and making connections to others and to the world. Physical and Health Education: Our identity is not a fixed entity. We experience many changes in our lives that influence our understanding of others and ourselves. Students begun the inquiry by asking questions about themselves and their school identity. They examined specific styles of art and media and explored through inquiry how that shapes who they are today. Through a critical review of the influence from forms of media including music, art, movies, television, and the internet, the students looked at the source where they may get their sense of identity. The students consumed media as a class and critically examined what in that media is affecting and influencing our taste, values, beliefs, and the significance of that. Activities explored included reports or sharing of their favourite media and why they are important to them. The students examined the positive and negative effects media have in shaping their identities. Student did wonderful onsite drawings and posed for photographs of A-Maze-ing Laughter by Yue Minjun. 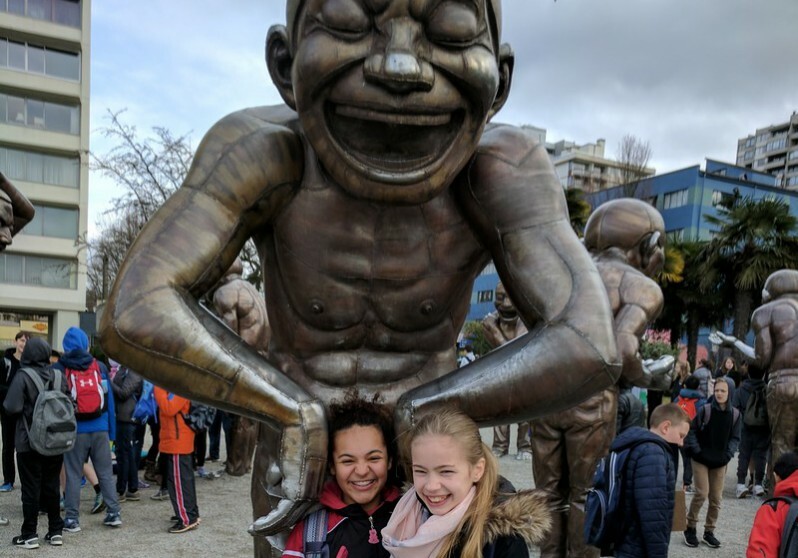 They draped a few computer parts over the arms and hands of the laughing bronzes in reference to the theme of censorship intended by the artist. 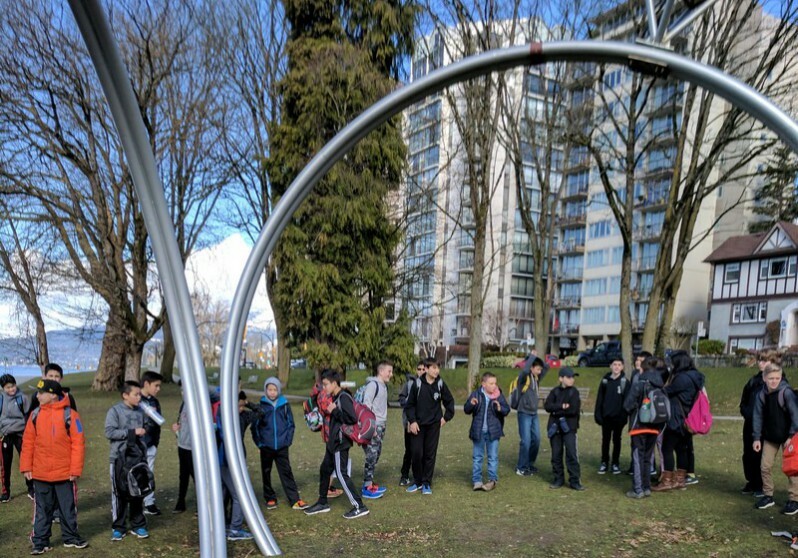 The students formed a ring around Dennis Oppenheim’s work entitled, Engagement. 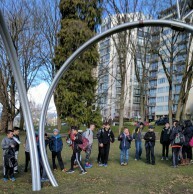 With almost 100 students in this tour, they took time to experience the scale of the rings, the light as a metaphor for the diamonds, and to consider the setting of the sculpture in the park. The concept of identity and a couple’s engagement were considered in this piece. 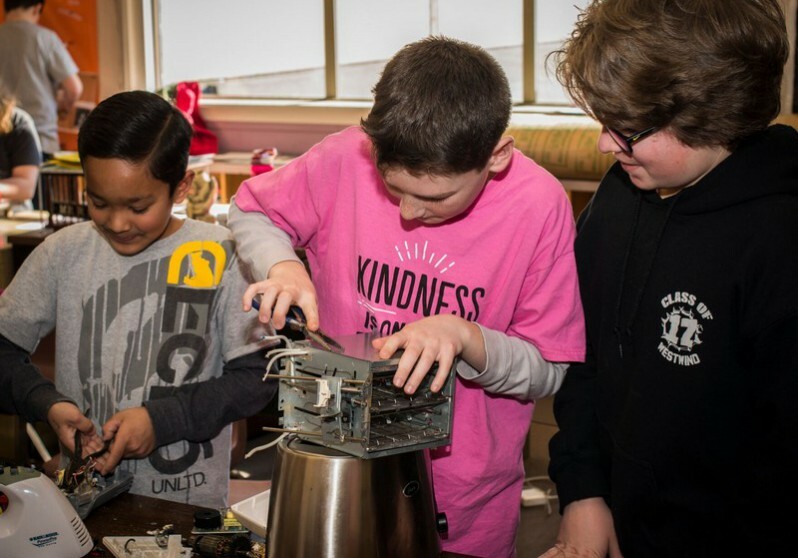 For the 2017 Biennale BIG IDEA theme of Making Global Connection, Westwind students engaged in a hands-on creative learning project in which the students discovered what was inside a wide range of objects by taking the objects apart and re-assembling them. 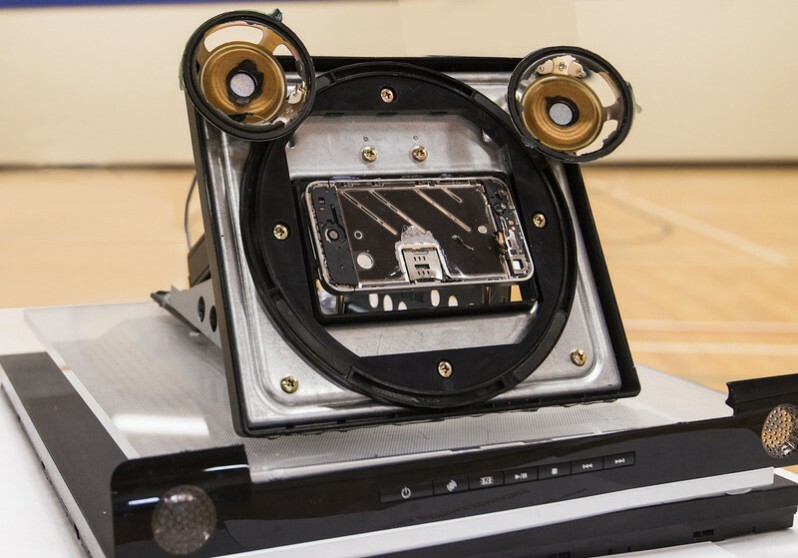 Students were encouraged to use imagination, ingenuity, and delight to transform ‘found’ parts into a unique and intact sculptural piece. After the introductory Power Point about the project and a quick demonstration on various appliances brought to the class to deconstruct. 1. Media communication items such: a computer keyboard, landline phone, answering machine, projector, radio, small TV, movie camera that no longer functions or you can no longer get film for. 2. Consumer appliances such as a: blender, toaster, mixer, heater, Panini maker, rice cooker, fan, hairdryer, small vacuum cleaner etc. 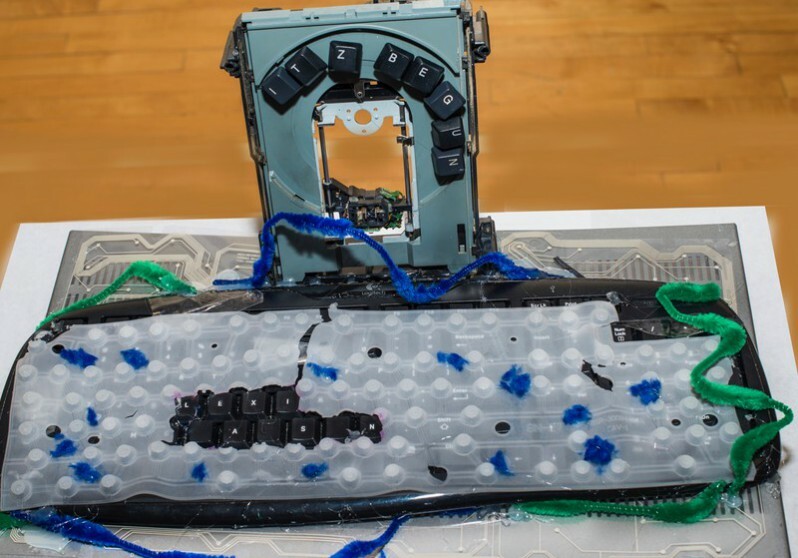 provided that the manufactured item did not contain toxic or harmful materials. 3. Deconstruction tools such as a screwdriver, hammer, wire cutters, wrenches etc. to take apart the manufactured item. 4. To reconstruct and connect the sculptural components, the teachers and students brought used magnets, wire, tape, duct tape, Velcro, string, raffia, thread, twist ties, shoe laces, pipe cleaners, hot glue guns, bull dog clips, fabric, wax, rags that can bind, wrap, or weave the pieces and parts of the sculpture together. 5. Teaching methods included demonstrations, student examples, conversations, and visual presentations. 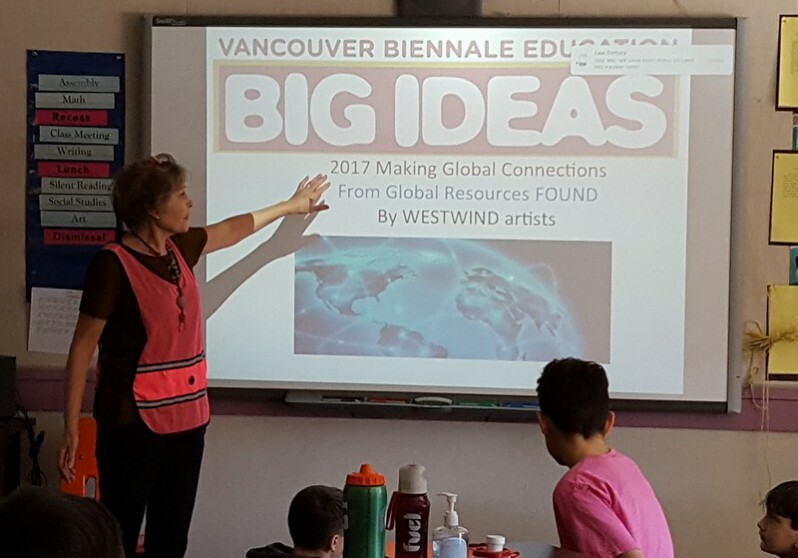 The students looked at the work of Biennale artists Vik Muniz, Ai Weiwei, and Marcus Bowcott as they related to this project. The Biennale art piece, Trans Am Totem, by Marcus Bowcott uses older ‘muscle’ cars to convey concepts that are evocative and open to interpretation by the viewer. Most students had noticed this sculpture and agreed that the Trans Am cars on the cedar plinth were cool! Other artists we viewed included Picasso and Louise Nevelson to see how they transformed ‘found’ objects, collected objects, and assembled objects into sculptural works of art. A Big Idea stemming from this investigation is that the materials used in the construction of art imply another layer of meaning. The sculptures that use text, light, and kinetic movement led to a discussion about the visual strategies each of the artists used to express their ideas. We viewed examples of artist and student works that used stacking, repetition, abstraction, repeating similar shapes such as boxes or circles, totems or pillars, or low relief wall pieces. Visual images such as Edward Burtynsky’s powerful factory images and his photographs from the mines and oil wells showed the staggering scale of the mines and the factories that are inherent in these manufactured products. 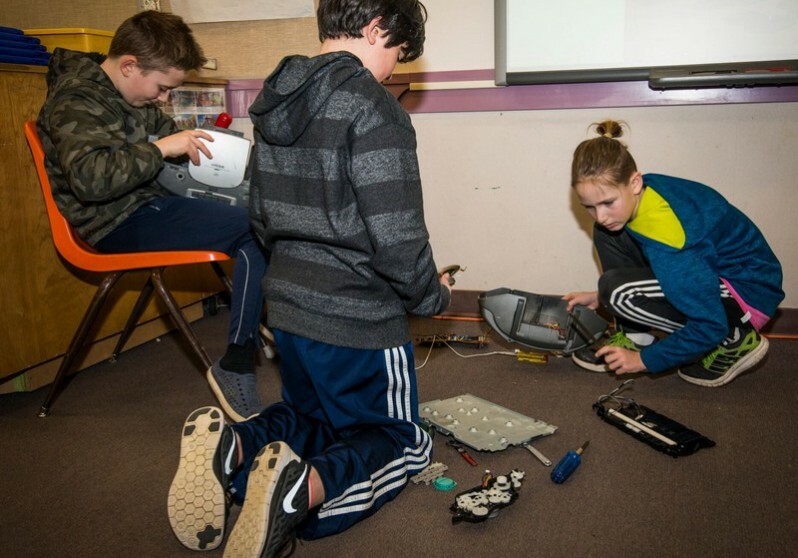 Students followed the supply chain of the minerals sourced from planet earth to the factories that amass all of the human resources and materials to produce the products. 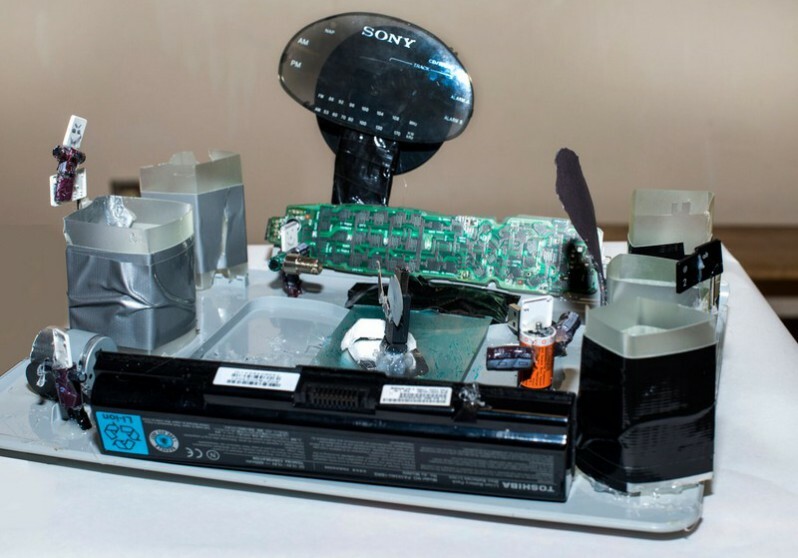 All of these items featured an electrical cord and plug, which gave pause to consider the role of energy in the use of these appliances. A Title for the Exhibit and Title Card for each of the sculptures. 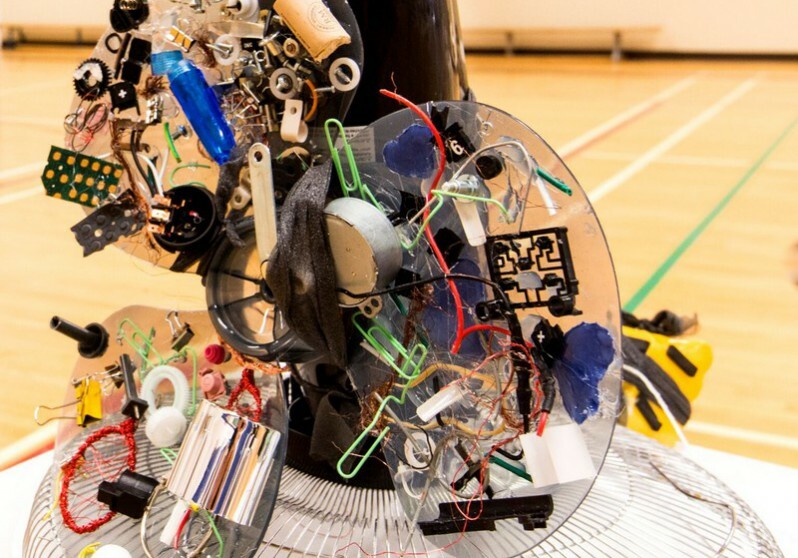 From the outset, students knew that everyone would be involved in exhibiting their sculptures in the school gym. For our exhibit, the 3D sculptural pieces were displayed on plinths (school desks covered with white paper). The leftover deconstructed parts were heaped onto wooden pallets to convey the global waste inherent in these consumer items. Students provided a title to their work and a brief project write-up. The viewers were given a few questions to prompt a dialogue with the artists. All of the school classes, many of their parents and people from the community picked up on the artists’ enthusiasm, making for a lively afternoon! 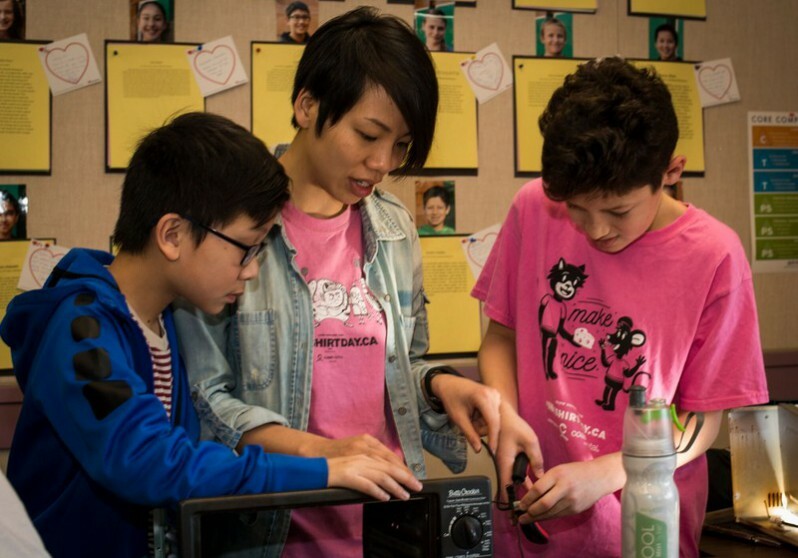 During the winter term of the 2016-2017 school year, we were fortunate enough to collaborate with visual artist Donna Sheh. From the outset, Donna had a very strong vision on how to connect art with our big idea of identity and media. In class, we made connections with the kind of media we consume and how it shapes our personal and cultural identity as a generation. With Donna, students took this a step further and examined how we are now in a period known as the anthropocene, an era where human activity is the dominant influence on climate and the environment. 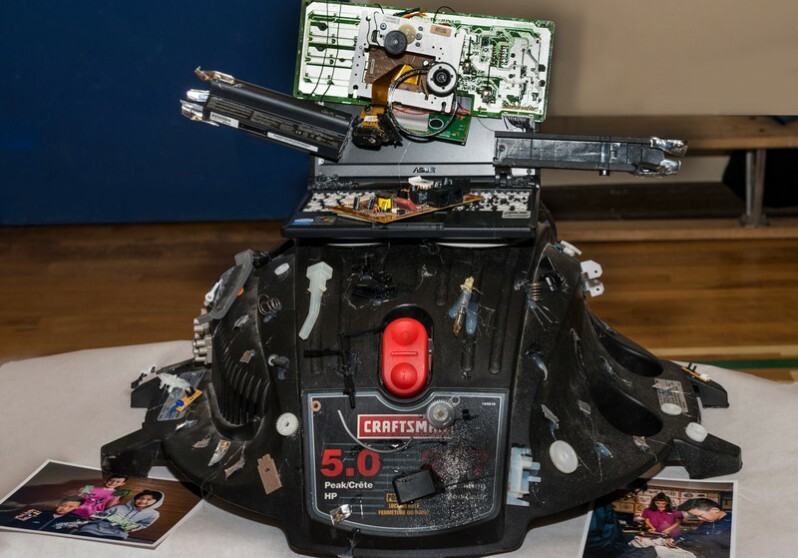 Through this lens, students brought in old, broken, or forgotten electronic devices to repurpose them as art. These pieces were deliberately chosen to deconstruct because they represent two things. First, they signified our wasteful consumer culture. 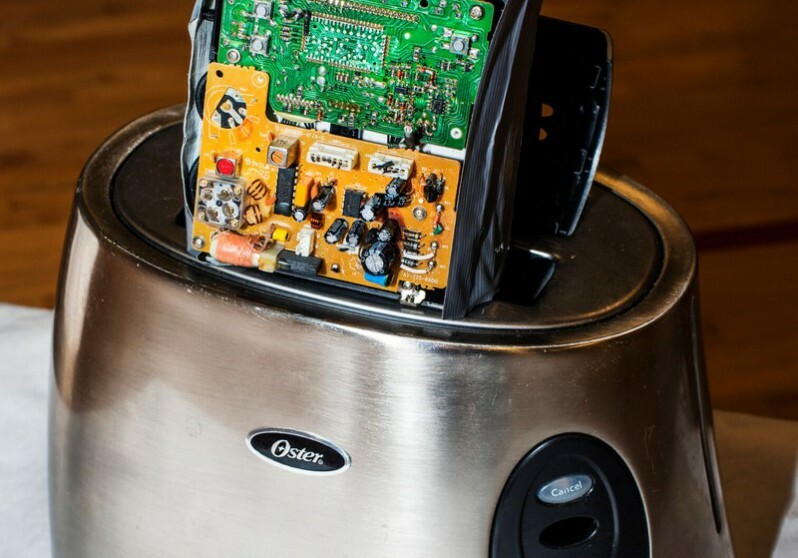 Second, many of these repurposed materials were once used to consume media such as old computers, or old stereos. The students then created sculptures that they felt represented their collective identities through art. 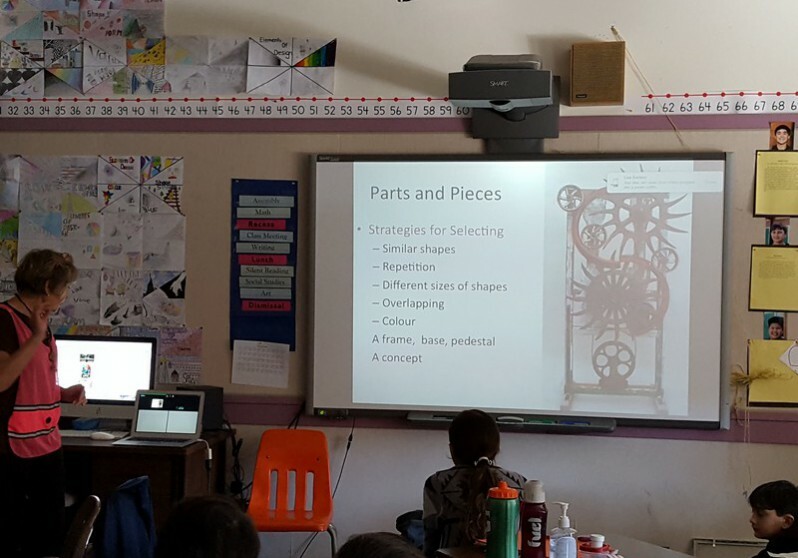 As teachers, we were thrilled to see how much our students enjoyed deconstructing and experimenting with a form of art that was exciting, new to them, and hands on. 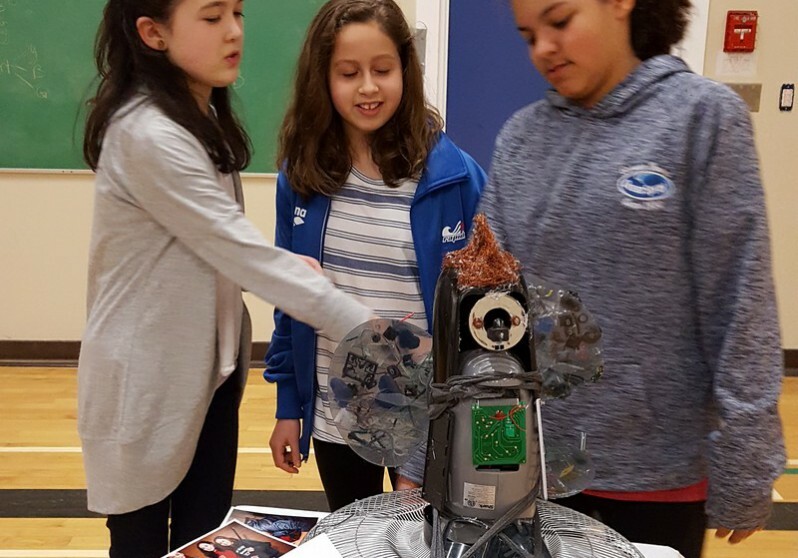 Donna was very approachable, and flexible, working well with all of the students and proving much needed guidance through the process of creating sculptures out of unconventional materials. We celebrated the finished products with a gallery presentation in our school gymnasium. 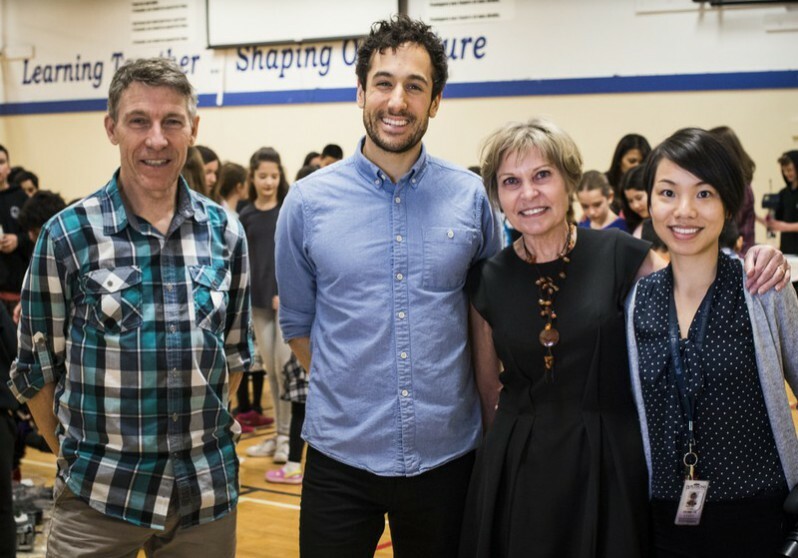 Every student at our school had the opportunity to visit the gym and view the students’ creations and ask the artists questions. They also had a chance to create their own recycled art project or take something home that would have otherwise ended up in a landfill. 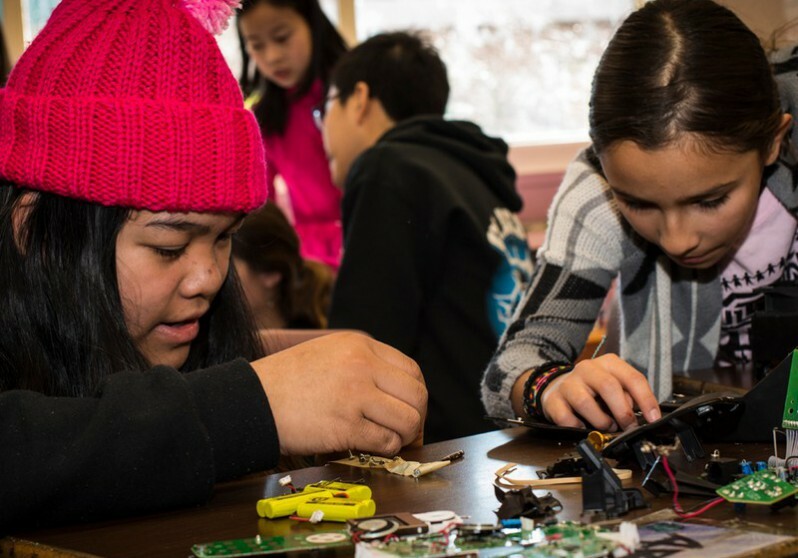 This powerful statement is a testament to our students’ vision of creating change and shaping their own cultural identity as a young generation: one that puts that planet first. 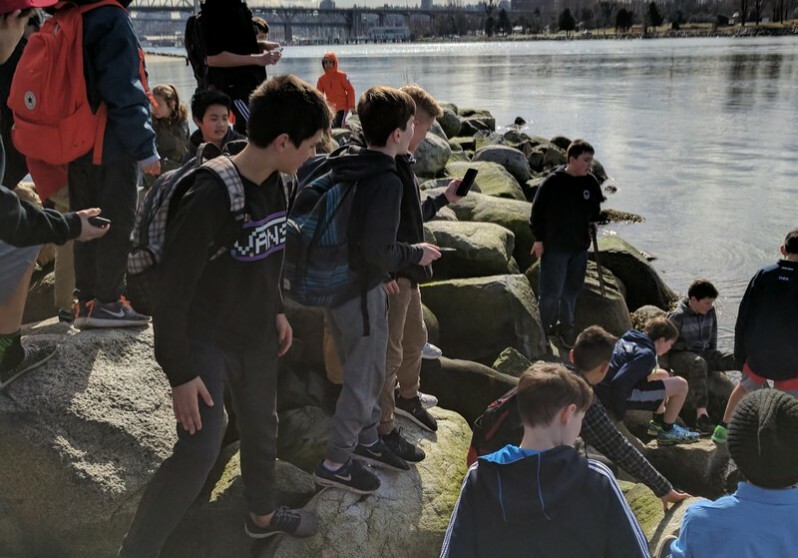 Our work with Donna culminated with a field trip to the English Bay to visit the sculptures, “A-maze-ing Laughter” and “Engagement.” Donna led the students through meaningful activities that had the students reflect on the art itself as well as its connection to our big ideas. Students were also given time to simply play with the sculptures and have fun. Donna was very knowledgeable about the history of the two pieces of art, making our experience that much richer. 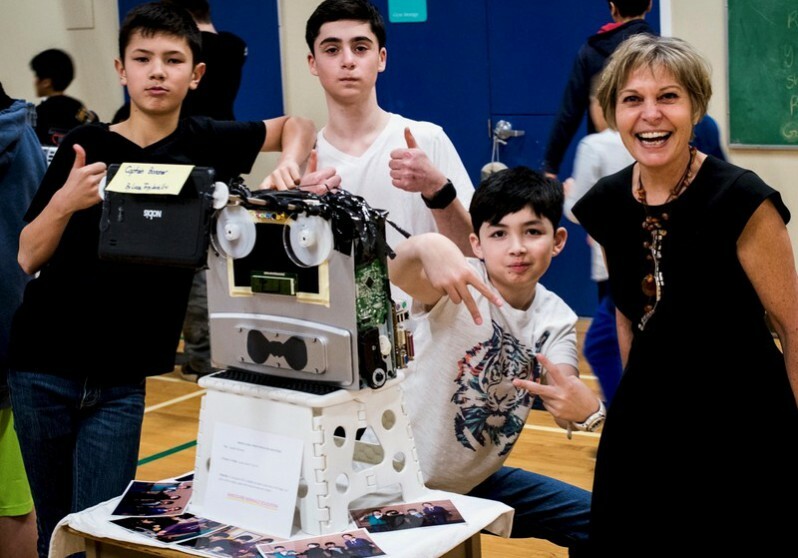 We are thankful to have worked with Donna and the Vancouver Biennale, and we look forward to working with them again. Thank you for Donna Sheh’s support through the Biennale process. We were impressed with how collaboration among students happened so naturally. The kids were highly engaged and they definitely enjoyed themselves. Donna’s personable demeanor allowed students to feel comfortable going to her for support. In end, our Creativerse Exhibition was a hit and we received many compliments by staff and students. 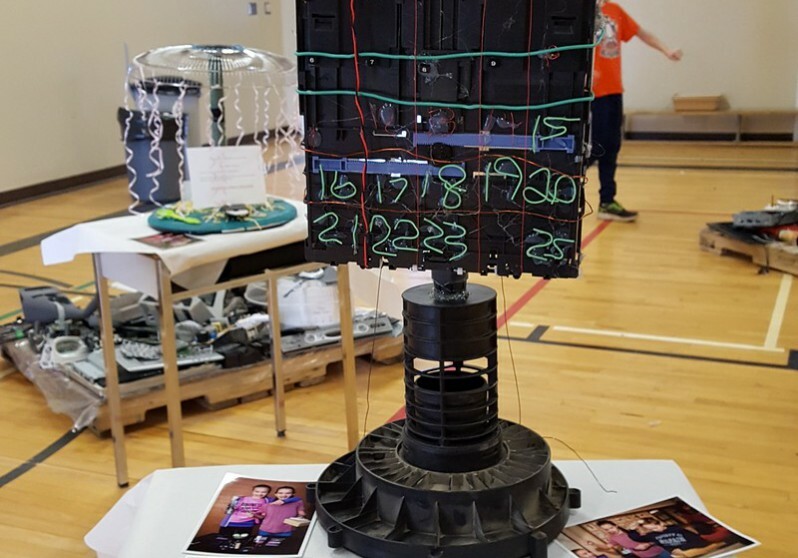 This was a project in which we created large pieces, used a variety of tools, counted on students to bring things from home, worked in teams, and rallied to the challenges. The crazy number of deconstructed pieces made for a complex task of selecting and constructing a sculpture. 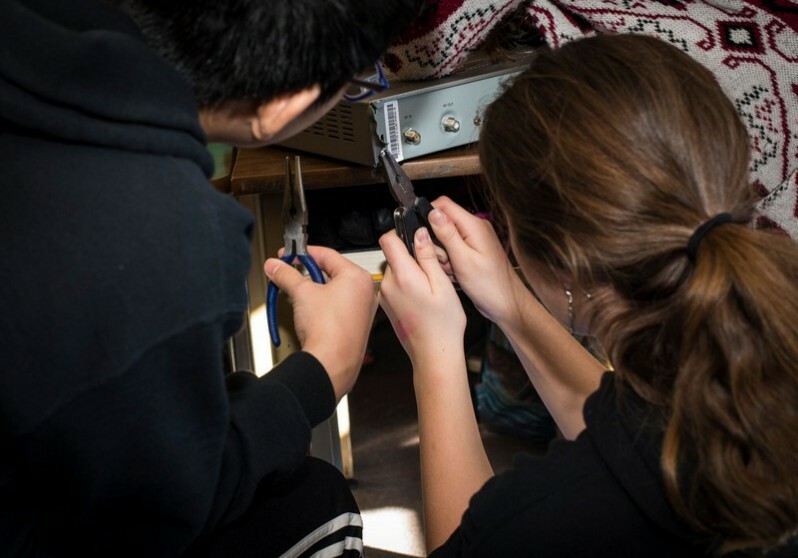 It also required storage space and living in a classroom that became crowded with broken stuff and works in progress. 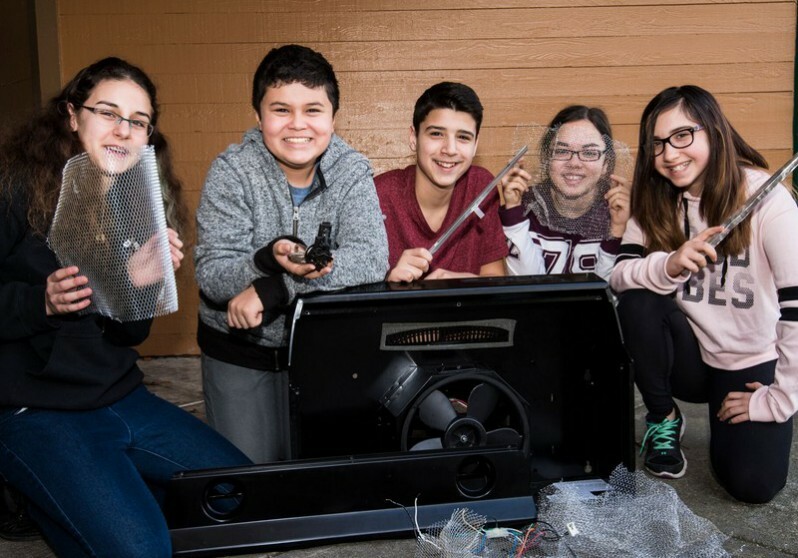 I was in total awe of the teachers who chose this project because they imagined that their classes would have fun with it. They were right. Their students were fully engaged in the creativerse! The teachers were totally on board, supportive, and helpful and seemed calm at every step. The final exhibit was a resounding success and a victory for the 90 or so students and teachers who made this a success for the school community. Special thanks to Richmond School District Maintenance Department for delivering and picking up the 6 wooden crates for the exhibit.